Cybex. Nautilus. Life Fitness. Hammer Strength. These are just a few of the brands of strength training equipment made popular by their ubiquity in health clubs, and for good reason: they offer options for lifting a variety of large muscle groups, are relatively easy to use, and don’t take up too much space. Just because they’re there, however, doesn’t mean they’re right for you. When selecting exercises for your strength routine, consider your desired results. Are you trying to put on mass? Lose weight and gain strength? Are you training for an endurance event like a triathlon? Also, are you recovering from a musculoskeletal injury? 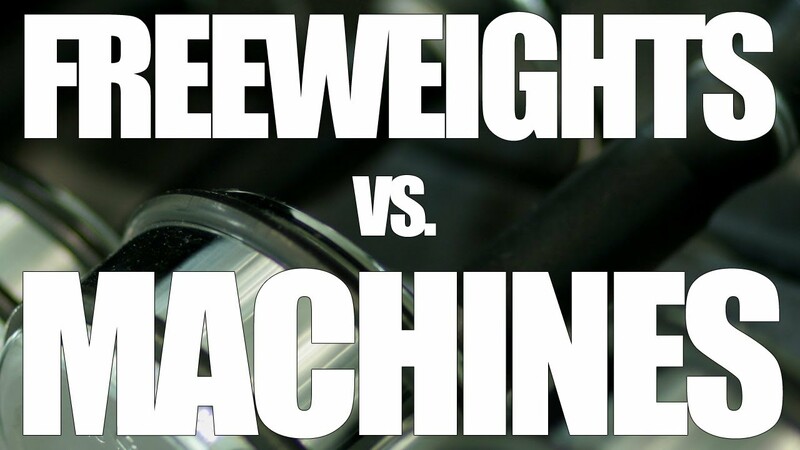 The answers to these questions will help dictate your choices in the weight room. Who can Benefit from Using Machines? Anyone trying to put on size. Though many bodybuilders prefer free weights, machines can be an excellent choice for those wanting to isolate particular muscle groups. Additionally, when performed using very high volumes of weight, some exercises require the stabilization a machine provides, such as the shoulder press. Those recovering from injury. If you’ve ever suffered a shoulder or knee injury, you know that on returning to exercise you can’t simply pick up where you left off. You’ll need to carefully rebuild strength in the injured area, and this often means avoiding unstable movements, at least at first. For instance, you might start with lightweight leg presses before attempting squats. Your doctor or physical therapist will generally make specific recommendations as to which movements to avoid. Beginners: Those new to the gym can find free weights overwhelming. They may also want to avoid injury by starting with exercises where the range of motion is controlled by a machine. This is completely acceptable at first, while trying to build a little strength and improve conditioning. Before long, however, beginners might want to consider hiring a trainer to show them how to perform movements safely and to recommend exercises that are appropriate to their goals. Who can Benefit from Using Free Weights? The answer: Everyone else. While you might still incorporate machine exercises, like pull-downs or the assisted chin for lats, those wanting to lose weight and/or gain strength, intermediate to advanced exercisers, and anyone training for a sport should absolutely include free-weight exercises in their workouts. Free weights as a category traditionally comprise dumbbells and barbells; for the purposes of this explanation we’ll put medicine balls, kettlebells, Body Bars, and bodyweight exercises, which often require holding these weights, under this umbrella. The most well-known benefit of free-weight training is that you learn to stabilize movements with your own muscles, rather than rely on a machine to control the movement. This makes for better balance, coordination, and a stronger core. Additionally, these exercises can be performed through a greater range of motion---ranges of motion that can mimic movements you do in everyday life, such as shoveling snow or picking up a child. One of the greatest benefits of free weights, however, is that they better utilize your entire body---rather than sitting on a machine, you could be on your feet performing bent-over rows, deadlifts, or biceps curls. This means more calories burned in the course of your workout. One type of machine that can benefit all exercisers is the cable machine (also known as the cable column or cable cross). An excellent option for maximizing range of motion, cables are extremely versatile---an endless number of exercises can be performed just by changing the handle or the height of the pulley. They also can be adjusted to suit exercisers of all sizes, and can even accommodate a wheelchair. If you’re unsure of the many uses of this machine, ask your gym’s fitness staff for assistance.